Drs. 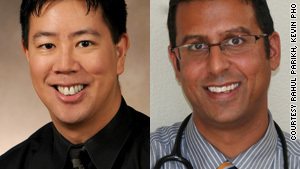 Kevin Pho, left, and Rahul Parikh, say tens of millions lack access to primary care doctors. Editor's note: Rahul Parikh, a pediatrician in Walnut Creek, California, writes the Vital Signs medical column for Salon.com, and Kevin Pho, a primary care physician in Nashua, New Hampshire, blogs at KevinMD.com. (CNN) -- America is closer to meaningful health care reform than at any time in its history. As we have all witnessed, finding a way to both provide every American access to affordable health care while seeking to control health care costs has not been easy. But in most cases, patients wait weeks or months for a primary care appointment, which often leads them to the emergency department for care that ordinarily can be handled in a doctor's office. Creating effective teams can help doctors focus on patients' well-being. At the Medical Associates Clinic and Health Plans in Dubuque, Iowa, for instance, support staff at all levels work closely with doctors and patients to ensure a productive encounter. Nurses huddle with their doctors prior to each visit and summaries of patients' lab tests, notes, current medicines and problems are reviewed. Receptionists are also involved, scheduling lab tests before and after encounters to ensure that doctors and patients have the information they need at each visit to change the plan of care. General practices in the United Kingdom use a similar team-based approach, and studies show that such teamwork is associated with improved care for patients with diabetes along with better continuity of care, access to care, and patient satisfaction. By contrast, according to a recent Commonwealth Fund survey, "U.S. physicians have not led in implementing ... the use of teams." One example is simple e-mail, which is beginning to make inroads in health care. A study from the University of Pittsburgh School of Medicine showed that parents who used e-mail to communicate with their child's physician increased access and improved the quality of care. Parents did not report that e-mail distanced them from their child's doctor and physicians found that answering patient e-mails was 57 percent faster than using the phone. Finally, if we build a health care system around the primary care doctor's office, then all other facets of care must be integrated with it. Specifically, involving specialists in the primary care experience can provide comprehensive care efficiently. At Kaiser Permanente in Northern California, specialists have introduced "p-consult" to provide this kind of integration. When a patient comes to see their primary care doctor with a problem that requires specialist input, the primary care doctor can call the specialist immediately from the exam room for consultation. Both primary care doctors and patients report that the program helps them get care right the first time, avoiding redundant visits and tests that drive up costs. For specialists, "p-consult" helps keep their access open for patients who need to be seen. The opinions expressed in this commentary are solely those of Rahul Parikh and Kevin Pho. Cafferty: Last chance for health reform?